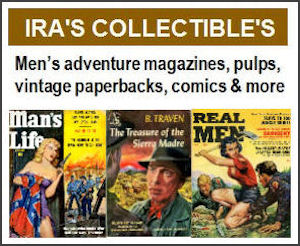 In November 2009, shortly after I launched this blog about vintage men’s pulp adventure magazines, I received a brief email from author Robert F. Dorr. I was aware, though not nearly as aware as I would become, that Bob Dorr is among the best and most prolific of the many great writers who once worked for the men’s adventure mags. In fact, he’s right up there with the top luminaries who regularly wrote for the genre, like Mario Puzo, Bruce Jay Friedman, Lawrence Block, Walter Wager, Robert Silverberg, Martin Cruz Smith and Walter Kaylin. Bob’s email to me led to many things. It led to an ongoing series of correspondence and phone calls that turned into a long-distance friendship, spanning the 1,200 miles between his home in Oakton, Virginia and mine near Key West, Florida. It led to a series of posts I wrote for this blog about Bob’s men’s adventure magazine stories and some of his later military aviation history books, such as HELL HAWKS!, MISSION TO BERLIN, MISSION TO TOKYO and FIGHTING HITLER’S JETS. It led to the creation, at Bob’s suggestion, of the Men’s Adventure Magazines Facebook Group, which now has over 1,500 members from all over the world. 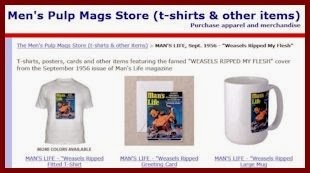 It led to the inclusion of two of Robert F. Dorr’s MAM stories in the first book in our Men’s Adventure Library series, WEASELS RIPPED MY FLESH. More recently, it led to the publication of our fourth book in the series, A HANDFUL OF HELL, a collection of classic war and adventure stories Bob Dorr wrote for men’s pulp adventure mags in the ‘60s and ‘70s. A HANDFUL OF HELL is now available as a paperback and in a special limited edition hardcover that includes additional stories and images. Both editions are lushly illustrated with dozens of full color scans of the covers of the magazines the stories appeared in and the interior artwork and photos used for them inside. Both include a fascinating autobiographical chapter Bob wrote especially for the book about the stories and his amazing life as an Air Force serviceman in Korea, a globe-hopping U.S. State Department diplomat who wrote men’s adventure magazine stories on the side, and his second career as a full-time professional author. Wyatt Doyle, my co-editor, book designer and head honcho at New Texture Books, has created in-depth previews of HANDFUL for the “Look Inside” feature of its listing on Amazon. He also posted another, even cooler, flip-page preview that you can see on the Issuu.com website. 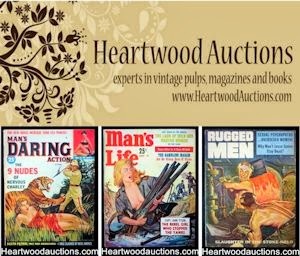 In this post on MensPulpMags.com and another to come, I’ll provide a slightly different type of preview: excerpts from Bob Dorr’s comments about the stories in his introduction, along with scans of the book pages showing the covers and interiors for the issues and stories he mentions. I was born on September 11, 1939. I grew up in the Maryland suburbs of Washington, D.C.
From childhood, I’ve had two main interests: airplanes and writing. I had my first paid magazine piece published in the November 1955 issue Air Force Magazine, the journal of the Air Force Association, when I was 16. Even though I couldn’t become a pilot I was sufficiently interested in the Air Force that I enlisted the day after I graduated from high school, in June 1957. The Korean War was over but it was still a very tense situation. It was like the Korean War without the shooting. The nation of South Korea I was stationed in from 1958 to 1960 was a very crude, primitive country that bears no resemblance to what it looks like today. Today it is in many respects ahead of us in education and technology. But not then. Part of what my squadron did was to fly reconnaissance missions in C-47s, In everyday jargon that would be a spy plane, although technically speaking a spy is a civilian. We were part of a massive communications intelligence operation that was going on around the world during the Cold War – and continues today. I got out of the Air Force in August of 1960, just before my twenty-first birthday. I then spent several years doing various things, mostly in California. I also went to Hong Kong. My goal was to become a writer. The editors paid me $100 for the story, about a B-26 crew in the Korean War. The Korean War was a popular subject then. That was the first of what became several hundred stories and articles in those magazines. I’m using the word articles somewhat loosely because almost all of them contained a great deal of fiction, though I tried to make them all seem to be as realistic as I could. I did the same thing with the first story in REAL that I did with almost all of the later men’s adventure magazine stories and articles. I typed them up on 8½ by 11 typewriter paper on a manual typewriter, using Whiteout, booze and cigarettes. I never did succeed in publishing literary short stories. I wrote some but didn’t get them published. But I began writing regularly for the men’s pulp magazines, in their heyday. Writing for the men’s adventure magazines was a learning process in many ways. I think the guys that put out those magazines deserve a lot of credit for helping to teach a whole generation of writers how to write. 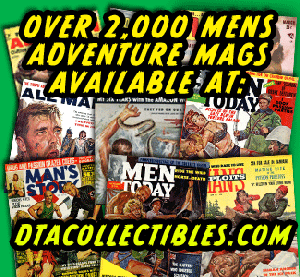 In terms of the readers of the men’s adventure magazines I wrote for in the first half of the ‘60s or so, when I did most of my writing for them, almost all of them were veterans. The situation was different then than it is today, when a veteran is perceived as sort of a separate category of human being that’s apart from everybody else. These magazines were read by regular guys. The fact that they happened to be veterans had something to do with shaping the content. But the fact that they were veterans is sort of an added fact to whatever else is true about them, since so many men were veterans back then. Between the Air Force and the time I entered the Foreign Service, there was a period of several years when I was going to college part time. I also worked some part-time jobs. But most of the time I was supporting myself with income from the men’s adventure magazines. 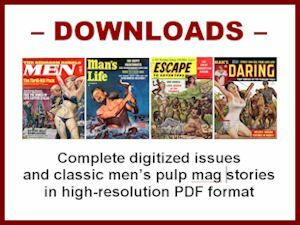 I wrote a lot for Magazine Management company, which published STAG, MALE, FOR MEN ONLY, MEN and others, and for Pyramid Publishing, which published MAN’S MAGAZINE and some other men’s adventure magazines. They usually paid me $350 per article and $350 was pretty good. Not only was it pretty good then, it hasn’t gotten much better. There are plenty of fine, high quality magazines that pay less than that today. For most of that period, I was moving around a lot, so I had a Post Office Box in San Francisco. I had a couple of Air Force buddies there that I hung around with, guys I had been in the Air Force with. I remember when we’d get together they would say: “Let’s go down to the Post Office today and see if you got a check from Man’s Magazine.” And every once in a while there would be that wonderful moment when there would be a check for $350 in the Post Office Box and we’d be rich. It was published in the October issue of CLIMAX, a men’s adventure magazine published by Macfadden Publications. It’s about Air Force Staff Sergeant Henry “Red” Erwin, who received the Medal of Honor in 1945. I was fascinated by Erwin’s bravery. He was a radio operator aboard a B-29 Superfortress bomber. During a mission over Japan, he suffered grave burns all over his body when he grabbed and disposed of a phosphorus bomb that had detonated prematurely inside his plane. It would have destroyed the aircraft and crew if not for his action. Erwin’s hands, face and body were severely burned. He was covered with bandages and expected to die when he became one of the very few American enlisted airmen to receive the Medal of Honor, our country’s highest award for valor. I didn’t do interviews for my men’s adventure stories like I later did for my history books. I did get to know Red Erwin decades when I interviewed Air Force veterans for one of my aviation history books, titled B-29 Superfortress Units of World War II, which came out in 2002. I never told him about the CLIMAX story. He died in 2002. Ten years later, and 50 years after my Climax story about Erwin was published, my more accurate and very real account of his bravery appeared in my book MISSION TO TOKYO. Another story I wrote in 1962 that was ultimately titled “The Bloodiest Single Mission in Air Force History.” It was published in BLUEBOOK FOR MEN, December 1962. Here’s a little aviation inside baseball about the name of that bomber. During World War II, the U. S. Army's standard medium bomber was the Martin B-26 Marauder. Late in the war, the Army introduced a new attack plane, the Douglas A-26 Invader. Both the B-26 and the A-26 had twin engines, tricycle landing gear, and guns protruding all over. When I sent my story about Douglas B-26 Invader bombers to BLUEBOOK, an editor wrote back and asked if I had photos. I did. I sent him valuable photos that were never returned. They weren’t used, either. BLUEBOOK illustrated the story with photos of the wrong kind of B-26: Marauders, not Invaders. On January 1, 1963, equipped with a roundtrip ticket and little cash, I traveled to Tokyo, Seoul, Taipei and Hong Kong, lugging an Olivetti Lettera-22 typewriter. During the trip I used it to write yet another tale about bomber crews in combat. This one was about a B-17 Flying Fortress bombing mission to Berlin. I sent it to STAG magazine from Hong Kong. Stag editor Noah Sarlat, with whom I later worked regularly but never met, sent me a note saying he liked it be he questioned certain details in the story, such as did American crews really use the term “bomber stream”? In fact, I told him, my background details were accurate. I’d never actually been inside a B-17, but I didn’t tell him that. My story "The P.O.W. General Who Tried to Kill Himself" was published in MAN'S MAGAZINE, November 1965. It’s about a real man, Major General William F. Dean. He fought in Europe in World War II before commanding the 24th Infantry Division at the outbreak of the Korean War. It was his misfortune to be in charge during the mid-1950 defense of the Pusan Perimeter when North Korean armor and infantry hammered a poorly equipped, under-manned, outnumbered U.S. ground force. Dean was awarded the Medal of Honor for his defense of Taejon, not for his subsequent brave conduct as a prisoner of war. The Code of Conduct of the United States Fighting Force is a United States Department of Defense directive that took effect during the Eisenhower administration in 1955, two years after the end of the Korean War. The Code did not exist when Bill Dean was a P.O.W. But he lived up to it and performed heroically in North Korean captivity. In 1951, when I was in the sixth grade, local newspapers carried stories about a T-33 Shooting Star trainer — the two seat version of the F-80 fighter then doing battle in Korea. I don't remember the newspaper stories making much of the fact that the T-33 pilot who lost his life was a decorated World War II fighter ace, Major Don Gentile. It is a true story, but a true story with some manufactured dialogue and a little embellishment. In 2003, I wrote a more straightforward article about Gentile for the magazine WWII HISTORY. Same story, done in different style, 38 years apart. Working together, they downed several three Aichi D3A Val dive bombers. Welch also downed a Mitsubishi Zero fighter. Both men were awarded the highest U.S. Air Force medal for their bravery, the Distinguished Service Cross. My story about Welch was the cover story in the December 1965 issue of Stag. I retold his tale as the cover story in the November 2003 issue of WWII HISTORY magazine. Yes, history magazines are prospering nicely nowadays, thank you, and they owe a huge debt to the men's adventure genre. I entered the Foreign Service in 1964. My first overseas assignment was in Madagascar from 1965 to 1967. I spent quite a bit of my spare time ay my typewriter during those years. Among other things, that led to two stories I wrote about American bomber pilots on lone-wolf missions into enemy territory to destroy vital enemy targets: “The ‘Impossible’ Raid” for STAG and “Yank Ace Who Saved the Anzio Invasion” which appeared in MAN'S MAGAZINE. The idea of one man, or a small force, attacking a vital target was the kind of thing men’s adventure magazine readers loved. It has also always been good stuff for novels and movies. I used it decades later in my novel HITLER'S TIME MACHINE. The closest thing in air warfare in real life was the “Doolittle Raid” on Tokyo on April 18, 1942—eighty men in sixteen bombers led by James “Jimmy” Doolittle, a Lieutenant Colonel in what was then called the U.S. Army Air Forces, before the Air Force became a separate branch. In the real world, when American could send thousands of planes on missions, as I later wrote about in books like Mission to Berlin and Mission to Tokyo, lone-wolf air attacks just didn't happen. The “Yank Ace Who Saved the Anzio Invasion” is a story about a guy who flew the “other” bomber. The B-24 Liberator has never received as much attention as the B-17 Flying Fortress, even though there were more of them and they served everywhere during World War II. The same is true of the P-47 Thunderbolt Fighter, which was the most numerous American fighter manufactured during that war. My book HELL HAWKS! covers the pilots, crew chiefs, armorers, repairmen and maintainers who worked on the P-47 Thunderbolts. And the book is a direct descendant of the work I did for the men’s adventure magazines. When I look at “Yank Ace Who Saved the Anzio Invasion” now I see the beginnings of a career writing articles and books about the experiences of wartime veterans in the Air Force, and I’ve been fortunate to be able to continue to do it. To read Part 2 of the excerpts from Robert F. Dorr’s introduction to A HANDFUL OF HELL click this link.